According to Larry Reeves, "I don't think the satellite challenge has been derailed by anything or anyone recently. I think we're alive and well and absolutely moving forward with our latest challenge." Teams from the University of Waterloo (top-left), Simon Fraser University (top right), University of British Columbia (bottom left) and the University of Victoria (bottom right) competing for the 2017 CSDC at UrtheCast HQ in Vancouver on November 2017. Photo's c/o CSDC. By day, Reeves acts as the "senior systems non-engineer in an engineering role" at Vancouver, BC based UrtheCast, but he spends his evenings and weekends shepherding the latest crop of Canadian Satellite Design Challenge (CSDC) teams. He spoke with this blog in response to the November 20th, 2017 post, "Entrepreneurs, Luxembourg, a Canadian Space Agency Secondary Payload Proposal & Maxar Technologies," which discussed the overlap between what the CSDC has been doing with university student run teams since 2011 and a recent Canadian Space Agency (CSA) request for proposal (RFP) to fund cubesat missions to be launched from the International Space Station (ISS). "Originally, as we first heard about the CCP concept. it was hard not to escape the perception that both the CSA and the CSDC were going after the same audience," said Reeves. "But after a bit of discussion, it was quickly evident that there are several differences between them." According to Reeves, "the CSA proposals are driven by professors and may be focused at the grad student level. The CSDC teams are driven by the students - both graduate and undergraduate, not their professors, and there are no limitations on the number of teams in each province which can participate." As well, the CSDC teams are also required to raise their own operational funding, while the CSA program offers grants of up to $200K for successful applicants. Taken together, there is plenty of opportunity fot both to co-exist, said Reeves. As outlined in the November 29th, 2017 CSDC press release, "CSDC Teams Complete Design Reviews and Radiation Testing Workshop in Vancouver," the current iteration of the competition has just finished its critical design reviews (CDR), plus completed a workshop to test the teams' satellite electronics in a simulated space radiation environment. Eleven of the fourteen participating teams gave 2.5-hour comprehensive presentations on the designs of their satellites and missions. The presentations encompassed technical details of the satellite sub-systems (power, attitude determination and control, communications, structure), the plans for how each team is managing their project (schedules, budgets, and risks), and a summary of the educational outreach activities they have done." The presentations were judged by a panel of experts from Canadian and US space companies and from the CSA and the CSDC Management Society, which organises the CSDC competition. Maarten Meerman, the systems engineering lead for low Earth orbit and small satellites for San Jose, CA based Space Systems Loral (SSL), a subsidiary of the newly-formed Maxar Technologies. 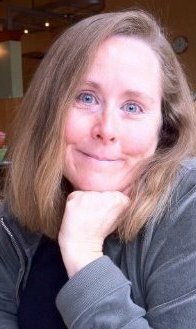 Meerman has been a judge or workshop mentor in all previous CSDC offering. Adam Latour, the lead product developer with Toronto, ON based Kepler Communications. Latour has also been a judge in a previous CSDC offering. Eric Gloutnay, an EMC & electronic component engineer with the CSA. Gloutnay is also a radiation effects expert, and assisted the teams in the radiation testing workshop. 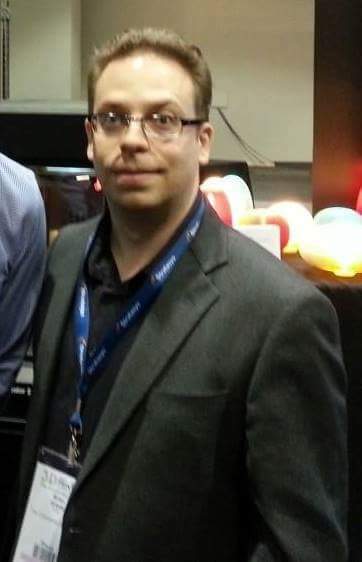 Stefanos Derminakis with UrtheCast, who was a member of the Space Concordia University team which won the first CSDC in 2012. This makes him the first CSDC alumnus to participate as a judge. During the same week as the CDR's, the teams also participated in a radiation testing workshop at the Tri-University Meson Facility (TRIUMF) at the University of British Columbia. TRIUMF has the world's largest cyclotron, which can be used to simulate the radiation environment in space, and test the robustness of electronics hardware, as well as the software which is required to detect and recover from the degrading effects. According to Reeves, the CSDC teams will now proceed to the build and test phase of their CubeSats and will hopefully incorporating the judges' CDR suggestions. Once assembled and ready, the cubesats will undergo a test next spring which simulates the vibration that the CubeSats will experience during launch and then a final winner will be announced. For a list of the teams participating in the current CSDC, check out the CSDC website at http://www.csdcms.ca/. As with many other items on this blog, this post will be updated as new information becomes available. One of the more interesting and offbeat sources of publicly available information on space focused startups is NewSpace Ventures, a website which tracks "lesser-known companies, organizations, programs, & projects shaping the NewSpace Industry." November 27th, 2017 screenshot of the NewSpace Ventures website. 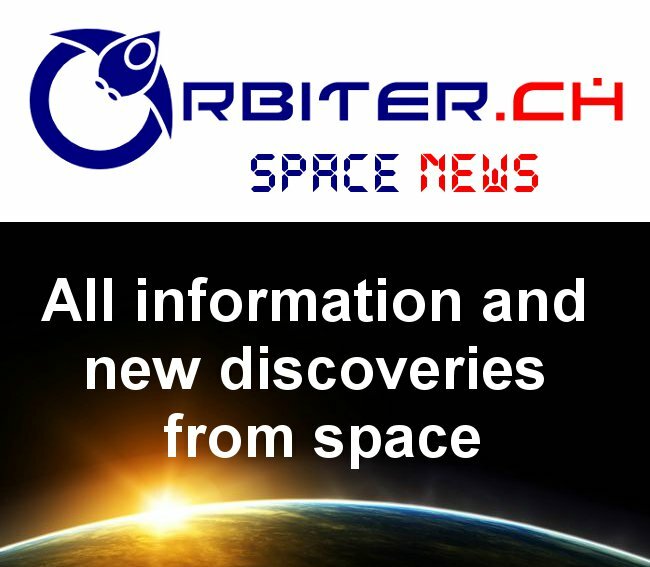 As outlined on the website, the intent of the project is to "share, discover, and discuss new and interesting NewSpace products and companies to spur excitement, generate ideas, and further entrepreneurial NewSpace ambitions." Graphic c/o NewSpace Ventures. The current website compiles publicly available information on over 1400 companies, products, projects, programs & services from over 60 countries. The information was collected by a small group of approximately 60 people operating mostly independently. I'm always searching for new, compelling businesses cropping up from the fast growing NewSpace Industry. As a space enthusiast, I believe it’s important to always be looking toward the future and follow market and industry trends. Seeing the new products, services, and capabilities can reveal new insights and inspire new ideas. And the earlier you discover them, the better. Available data includes corporate names, websites, twitter feeds, a description of their product/ services/ product segment and a preliminary list of government rules/ regulations relating to the firms products or services. Although far from complete, it's well worth checking out to get a sense of the opportunities available to entrepreneurs interested in participating in our next great space age. The Japanese government has announced tentative plans to send astronauts to the surface of the Moon in cooperation with the US by utilizing NASA's proposed Deep Space Gateway (DSG) lunar space station. It worked once before so let's do it again! According to Canadian Space Agency (CSA) director-general of space exploration Gilles Leclerc, the CSA is developing a new and smaller robotic arm as its contribution to the planned DSG. As outlined in the September 29th, 2017 Toronto Star post, "Canadian Space Agency and its partners developing plans for lunar space station," the CSA began funding the project as early as September 2017 when MacDonald, Dettwiler and Associates Ltd (now MAXAR Technologies) was "awarded a $2.75Mln CDN contract to work on the new Canadarms." Here's hoping that Leclerc and his CSA colleagues would also be happy to sell Canadarm's to Elon Musk, Robert Bigelow or anyone else looking to build a space station. Photo c/o Toronto Star. But while the inclusion of international partners such as Russia, Canada and Japan, plus the likelihood of bringing aboard the rest of the nations who collaborated to build the International Space Station (ISS) has certainly broadened the DSG’s potential base of political support, the project is still very much a paper proposal without funding or hardware. The DSG is also struggling to combat the growing perception that it's mostly just a smaller version of the existing ISS in a slightly more eccentric Earth orbit. And the public private partnership (P3) proposals being bandied about as funding mechanisms for the DSG are facing stiff competition from less complex, private sector derived proposals to do much the same thing. As outlined in the November 26th, 2017 Japan News post, "Govt eyes manned lunar surface mission," Japan hopes "to join the US project to construct a spaceport in lunar orbit in the latter half of the 2020s, in an effort to realize a lunar surface exploration mission by a Japanese astronaut. The government plans to submit a draft report on the project to a meeting of a governmental panel of space policy experts." First announced in September 2017 as a joint venture of NASA and the Russian federal space agency Roscosmos, the DSG is a crewed lunar space station concept proposed for construction in the 2020s. The DSG would be used as a staging point for robotic and crewed lunar missions as well as NASA’s proposed Deep Space Transport, an interplanetary spacecraft utilizing electric and chemical propulsion intended for crewed missions to Mars. Originally part of NASA’s now-cancelled Asteroid Redirect Mission, the DSG would be developed and deployed in collaboration with commercial and international partners. Japan is a current partner in the ISS and ISS operations have been confirmed through 2024 but operations beyond that year remain uncertain. American and Japanese leaders agreed to a general declaration to promote cooperation in space exploration at the November 6th, 2017 Japan-U.S. summit meeting. By joining the DSG project, Japan hopes to realize its goal of landing a Japanese astronaut on the lunar surface. Such a goal would serve several purposes; scientific return, boosting the competitiveness of Japan’s space industry and asserting Japan’s leadership in the field of space resource utilization. The Japanese government plans to compile a report on the future of international space exploration through its Committee on National Space Policy and then, in December, will revise its space policy road map to include technologies needed for lunar exploration. Tokyo intends to begin full-fledged negotiations with the US once a new NASA Administrator has been appointed. Prior to the 2016 US presidential election, NASA had publicly stated it was considering selling the ISS to the private sector, but the new Donald Trump administration has been slow to offer its vision for a post-ISS era. But interestingly enough, the government supported DSG has at least one direct, private sector competitor. This past September at the 2017 International Astronautical Congress in Australia, space entrepreneur Elon Musk announced that his company, SpaceX, will utilize its new BFR rocket to build a lunar surface base (dubbed "Moon Base Alpha" by Musk) by 2022. This lunar base will then be used as a staging point for SpaceX’s planned crewed and robotic missions to Mars. SpaceX’s track record of success driven by innovative low-cost technology stands in stark contrast to NASA’s long history of repeatedly cancelled, prohibitively expensive programs. SpaceX’s committed investors and customers as well as its excellent public relations provide a firm support base for its Moon and Mars plans. The DSG is essentially a US government jobs program being run up the flagpole to see if anyone salutes. The DSG also seems to require the Space Launch System (SLS) a large, expensive and single use NASA designed rocket (a derivative of the cancelled large, expensive and single use Constellation program) which keeps slipping behind schedule/ budget and may never reach operational status. Oddly enough both the SLS and the DSG were designed to utilize previously existing technologies derived from earlier programs (the space shuttle in the case of Constellation/ SLS and the ISS in the case of the DSG) in order to retain existing skill-sets and minimize industry layoffs. The SpaceX Falcon family of rockets were under no such design constraints, which allowed for a surprising amount of innovation (including reusability) to be incorporated incrementally into later models at a far lower overall cost. And SpaceX isn't the only private sector competitor. The Blue Origin BE-4 engine, currently under development, is also considered to be a "game changer" for the space industry. If we are indeed seeing a "second space race" between the public and private sectors rather than global superpowers, private interests seem to have a firm lead. It's worth noting that not all Canadian companies who work with NASA need to work through the Canadian Space Agency (CSA). Nor are they required to focus only on the Deep Space Gateway, a crew-tended cislunar space station concept proposed for possible partnership between NASA, Roscosmos and other current International Space Station (ISS) partners as a follow-on project after the expected decommissioning of the ISS in the 2020's. As outlined in a November 16th, 2017 NASA synopsis/pre-solicitation notice describing the pending release of appendix D of the Next Space Technologies for Exploration Partnerships-2 (NextSTEP-2), NASA is also seeking proposals from both "US and non-US institutions" for the design, fabrication, and testing of in-situ resource utilization (ISRU) components and subsystem technology. NASA will be seeking proposals for research contracts in areas for design, fabrication, and testing of critical components and subsystems for acquisition and processing of extraterrestrial resources into water, oxygen, and fuel, using technologies and processes that leverage and support space or terrestrial commercial activities. 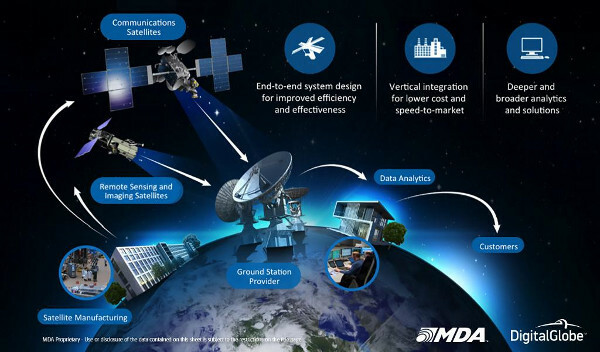 While mission timeframes for ISRU technology are all in the 2020's and later, development of these technologies needs to begin well before the listed time horizon. The requested research ranges from trade studies, to component development, to component and subsystem development. NASA anticipates there could be multiple fixed price contracts awarded in the requested areas, depending on the scope of requirements met and resources available for the effort in NASA's portfolio. The duration of contracts will vary depending upon the complexity of the studies or development effort. NASA anticipates phased approaches that may extend up to 5 years. NASA intends to require minimum cost sharing thresholds and/or matching for the proposed efforts, which may include prior industry investment. NASA anticipates that the ISRU technology broad agency announcement (BAA) solicitation will be issued on or about Dec 1st, 2017 and expects to hold a "virtual industry forum" on December 11th, 2017. Details on the forum will be posted to the NextSTEP website over the next week. As outlined on the NASA NextSTEP program website, NextSTEP is "a public-private partnership model that seeks commercial development of deep space exploration capabilities to support more extensive human spaceflight missions in the proving ground around and beyond cislunar space—the space near Earth that extends just beyond the moon." NASA issued the original NextSTEP broad agency announcement (BAA) to US industry in late 2014, and the second in April 2016. The second NextSTEP BAA is an omnibus announcement with appendices that will solicit proposals in specific research areas, including habitat systems (appendix A), in-space manufacturing (appendix B) multi-material fabrication laboratory power and propulsion element studies (appendix C) and ISRU technologies (appendix D). The NASA NextSTEP program is open to all categories of US and non-US institutions, including NASA Centers and other Federally funded research and development centers (FFRDCs) government agencies, companies, universities and nonprofit organizations. Eligibility for participation is tailored for each research area. Additional background about NASA’s ISRU activities is expected to be available over the next week at https://www.nasa.gov/isru and anyone looking for more information should contact Mr. Nantel Suzuki, the ISRU program executive at the NASA human exploration and operations mission directorate (HEOMD) advanced exploration systems at HQ-NextSTEP-BAA@mail.nasa.gov. Taking a long view on investments and their returns, Lori Garver has offered up a vision of space policy which would have been anathema in her time as deputy administrator for NASA. According to Garver, “fundamentally we need to shift how we invest our public dollars,” in the space industry. Lori B. Garver, the current general manager of the Air Line Pilots Association (ALPA), and the former deputy administrator of NASA. Photo c/o Allison Rae Hannigan. Investment in space was the theme of the day at the “Space Summit: A New Space Age,” presented by The Economist Events, which came to the Museum of Flight in Seattle on November 9th, 2017. In an interview with me after her panel session, I asked Garver what she thinks the future holds for US space policy. I wanted to know what she wants to see happen, compared to what the current trends predict, and whether any daylight exists between the two views. Her answer was in alignment with most of what we heard during the conference and also provided a more nuanced position. Taking the longer view, she said, is important, and overall the future is positive. Once we in the space business get started along a successful direction, it will become reinforcing. Success builds on success, basically. Garver quoted a study that has recently been performed by NASA that compares the cost of procurement along classic, "cost-plus" contracting practices with the more recent, "NewSpace" model used to engage SpaceX’s Falcon 9 and other launch services. The savings, which translate into returns on investment, are far greater with the new model. Commercial off-the-shelf (COTS) and commercial resupply services (CRS) historical financial data compared to space shuttle expenses when it comes to transporting items into orbit. Measures of cost per kg of cargo shown are for the actual tonnage delivered, not the maximum the spacecraft or carriers are capable of hauling. The measure includes the cost to NASA for launch services where the launch failed, with zero payload delivered. The data is current as of SpaceX CRS-11, which launched June 3rd, 2017. Chart c/o Edgar Zapata/ NASA. The study, “An Assessment of Cost Improvements in the NASA COTS/CRS Program and Implications for Future NASA Missions,” by Edgar Zapata of NASA, compares the economics of cost-plus procurement with commissioning a private partnership such as the one undertaken several years ago by NASA with SpaceX. It’s a basic “old space” vs. “NewSpace” comparison. Given NASA’s mission to launch crew and cargo to the International Space Station (ISS), a comparison is made between previous costs involved with the Space Shuttle and with the current model of the commercial crew (CCP) and commercial off-the-shelf (COTS) programs. A clear benefit is demonstrated with the NewSpace Model. For example, NASA invested $140Mln US ($178Mln CDN) in the Falcon 9 under the COTS program, and the calculated return on investment (ROI) is estimated as over $1Bln US ($1.27Bln CDN) from the 20+ launches that would have otherwise gone abroad. Government investment, in other words, resulted in creation of new capabilities that translate into increased tax revenues, economic activities, jobs, etc. During her panel, she said that tax payer dollars must never be wasted again on big missions at NASA, and that the government role is to invest in leading edge, enabling technology, so that commercial concerns can optimize the tech and create missions in a less wasteful way. She expressed these opinions in a room full of accepting professionals; however this type of approach was not always considered logical or desired. When I asked her about this, she did amend her position to say that we sometimes have other, non-economic reasons for government to “cast further for missions with other Whys.” She gave as an example that when we went to the moon with the Apollo program, the "why" was to beat the Russians. In the future, the ‘why’ could be defending against errant asteroids, for example. I asked Garver about leaving the space sector to go to the ALPA, and she was quick to remind me that she never left the space business. She is on the board of San Franscisco, CA based Maxar Technologies, which she joined in 2015 when it was known as Burnaby, BC based MacDonald, Dettwiler and Associates (MDA). But Garver talks about investment in more than just space economics. She believes in investing in people, too. When Garver started talking about Brooke, the Fellowship, its successes, and its future, it was clear that she will be pouring all of her considerable talent and energy into this worthy endeavor in the future. For more on the new space age, check out my November 14th, 2017 post, "The Economist Assesses the Space Industry." Allison Rae Hannigan is an impassioned space industry professional focused on development opportunities, marketing, and business related to microgravity and earth observation sectors. She is also a free-lance consultant who has created marketing communications campaigns, as well as provided market research, and regulatory expertise to the international space community. While the rest of the world (especially Luxembourg and the US) race to embrace the new opportunities expected to derive from high risk space mining concepts, corporations move forward with the development of massive Earth imaging and communications micro-satellite constellations and even begin to dip their toes into the waters of Martian colonization proposals, it's worth noting that our government supported Canadian Space Agency (CSA) is satisfied with proposing a variety of dull and mundane "ideas" suitable for "secondary payloads" on someone else's mission. Given that, and for the week of November 19th 2017, here are a few of the items we're currently tracking for the Commercial Space blog. Speaking of Luxembourg, as outlined in the November 19th, 2017 Forbes post, "Luxembourg's Bet On Space Industry Shows Early Signs Of Success," people are beginning to at least pay attention to the real space economy. As outlined in the article, Luxembourg had projected 200 attendees at the 2017 New Space Europe conference, which took place in Luxembourg City on November 16th - 17th, 2017, was co-sponsored by the Ministry of the Economy of the Grand Duchy of Luxembourg and calculated in part to showcase the country's rising international profile in an increasingly hot new industry. But over 400 people showed up, which was far more than expected. Many of the speakers at the conference were sourced through the Arlington, VA based Space Frontier Foundation, an American space advocacy nonprofit corporation organized to promote the interests of the private sector in space. According to Laurent Schummer, a partner at the Luxembourg law firm of Arendt & Medernach, "Luxembourg offers a whole ecosystem and expertise for raising capital and the legal framework operators need, with a government offering the whole infrastructure. All major players know Luxembourg as a secure place. All our clients in startup and on the space scene need money and we can help with that." According to the article, it also helps that the Luxembourg government has set aside €200Mln ($339.5 CDN) to invest in companies that want to join the space race in exchange for their presence in one form or another in the Grand Duchy. As outlined in the July 14th, 2017 The Register post, "Luxembourg passes first EU space mining law. One can possess the Spice," the tiny country has recently passed a series of domestic laws to make it easier for space focused companies to set up shop. And, as outlined in the October 31st, 2016 post, "'Super' Flow Through Tax Shares & Why Space Companies Need Them," Canada had the opportunity to set up a series of very similar industry friendly laws in the past, but has so far declined to do so. One of the real reasons for the current CSA focus on small-sats is the Canadian Satellite Design Challenge (CSDC). Beginning in 2011 this small not-for-profit Canadian organization ran a series of contests where university students built cube-sats with science payloads The third CSDC began early this year but was essentially derailed when, as outlined in the Jun 8th, 2017 CSA post, "Call for Letters of Interest – Canadian CubeSat Project," the Federal government under the CSA began funding university cube-sat proposals as part of the Canadian Cubesat program. Graphic c/o CSDC. Speaking of Canada, while our Canadian space agency has at least been trying to do something, it doesn't seem to have been all that successful, at least so far. As outlined in the November 20th, 2017 Spaceq post, "The Canadian Space Agency is Looking for Ideas for Secondary Planetary Science Payloads," the CSA initially issued a request for proposals (RFP) looking for concepts for "secondary science payloads" for a future mission with NASA. Cancelled November 20th, 2017 CSA NPP. Graphic c/o CSA. The SpaceQ post initially referenced a November 20th, 2017 notice of proposed procurement (NPP) on the Space Exploration Concept Studies for Planetary Secondary Payloads and Nanomissions, the structure of the NPP left open a wide variety of options, which would provide the CSA "flexibility in deciding what would work based on future mission decisions by NASA." The original proposal was based on ideas from a 2015 joint CSA-NASA Ames "information session" on low cost space exploration missions. But that NPP has been superseded and in record time. As of the evening of November 20th, the original November 20th, 2017 NPP is off the table and listed on the website as being "Archived/ Cancelled." The original closing date, still listed on the available website documentation, was January 8th, 2018. A new request for proposals (RFP) had been posted in its place, in the form of the November 21st, 2017 post, "Études concept. Charges utiles secondaires & nanomissions (9F050-170072/B)," which also focused on the same area of "concept studies related to secondary payloads or nanomission investigations for planetary exploration." Otherwise, the new proposal is much like the old proposal and follows through with most of the concepts discussed in the original, at least at first glance. Interested parties have until January 8th, 2017 to submit their proposals. Up to three proposals will be selected and provided with a maximum of $200K CDN per proposal. A bidders virtual conference will be held on November 30th, 2017. Given that the new proposal is also in line with previous proposals under the October 20th, 2017 Canadian Cubesat program CSA webpage, the assumption is that this new funding will attract college and university proposals which would previously have fielded teams for contests like the Canadian Satellite Design Challenge (CSDC). CSDC is a small, privately run not-for-profit Canadian owned and operated contest "for teams of university students (both undergraduate and graduate) to design and build a “Cubesat” – a small, fully-operational satellite – which will conduct a science mission," and has been in operation since 2011. It doesn't offer up millions of dollars of government money, but it is functional and had a very successful run until the CSA began offering up it's version of academic small-sat development earlier this year. The post will be updated when new information becomes available. And finally, now that all the fuss and bother surrounding the re-incorporation of San Francisco, CA based Maxar Technologies has mostly been dealt with (except perhaps for its final reincorporation as a completely US based firm which, as outlined October 12th, 2017 post, "Osborne Steps Down at Canadian MDA as it Responds to Questions About its US Based "Maxar" Future," should happen sometime in 2019), it's worth noting that the company is considered to be only a "mid cap" stock by US investment firms. And, as outlined in the November 21st, 2017 post, "What You Must Know About Maxar Technologies Ltd’s (TSX:MAXR) Financial Strength," mid-caps stocks like Maxar, with a market capitalization of only $4.43Bln CDN, aren’t "the focus of most investors who prefer to direct their investments towards either large-cap or small-cap stocks." If nothing else, this will cause the usual suspects in industry to reassess their perception of the value of holding Maxar stock which, back when it was known as MacDonald Dettwiler (MDA), was a far more magnetic stock for investors. The November 19th, 2017 The Ledger Gazette post, "Scotiabank Lowers Maxar Technologies Ltd (MAXR) to Sector Perform," is only the first of an expected series of financial industry reassessments expected now that the company has officially joined the lower tier of the big leagues. Expect more reassessments in the near future. For more, check out upcoming issues of the Commercial Space blog. For those who missed it, selected video's from the 9th Canadian Science Policy Conference (CSPC2017), which took place in Ottawa, ON between November 1st - 3rd, 2017, have been posted online. Remarks by the Governor General of Canada, the Right Honourable Julie Payette. Science minister Kirsty Duncan's interview and keynote speech. A conversation with Canada's chief science advisor, Dr. Mona Nemer. Mehrdad Hariri's opening speech from the CSPC 2017 evening gala. The plenary session on the fundamental science review panel as of November 2017. More CSPC 2017 videos and interviews are available on the CSPC YouTube channel. Audio recordings and photos are also available. This annual event is organized by the Canadian Science Policy Centre to serve "as an inclusive, non-partisan and national forum uniting stakeholders, strengthening dialogue, and enabling action with respect to current and emerging issues in national science, technology, and innovation policy." For those who don't believe the hype from the Ukrainian government and others that the Ukrainian space industry is capable of rebuilding facilities rendered inoperative after the 2014 Crimean Crisis or remaining competitive in the face of growing challenges from low cost NewSpace launch providers like SpaceX, you may be right. 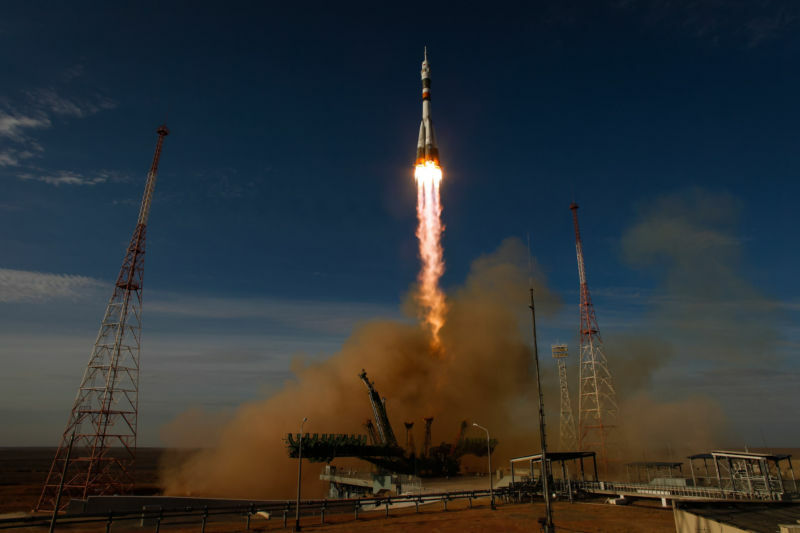 A Soyuz rocket launches from the Baikonur Cosmodrome in Kazakhstan. Ukraine has no indigenous launch capabilities but instead depends on facilities provided through the Russian Federal Space Agency (Roscosmos) and others. Photo c/o Ars Technica. The tests on the RD-861K engine, the Ukrainian built rocket engine expected to be used as the 2nd stage of Maritime Launch Services (MLS) proposed Canadian launched, Cyclone 4M rocket, are expected to resume this month, after a short break to assess tests performed in October, 2017. But there remain questions over whether the final engine can be built in useful quantities using domestically sourced, Ukrainian technology. As outlined in the November 14th, 2017 RussianSpaceWeb post, "Ukraine resumes testing of the RD-861K engine," the earlier test also acted as sales aids to validate the program to potential investors and foreign buyers. The resumption of the tests should also boost the morale inside the beleaguered Ukrainian rocket industry, which has faced many problems after the breakdown of its ties to Russia in the wake of the annexation of Crimea in 2014. In particular, the Ukrainian propulsion systems depended on supplies of Russian structural materials and hardware. Experts familiar with the matter say that the RD-861K engine is almost ready for operational use, but its development and serial manufacturing still faces serious challenges due to lack of resources, personnel and propellant components. The engine burns hydrazine and nitrogen tetroxide (carcinogenic hypergolic propellants) which are not currently produced in Ukraine and have to be imported from China. There are also problems with the production of new components for the engine, which forced engineers to recycle parts from older units and caused several delays in the latest tests. The post goes on to state that, "one industry source told RussianSpaceWeb.com that KB Yuzhnoye (the rocket designer) had been able to line up domestic suppliers of the structural materials necessary for the RD-861K program." ... the production of the turbine for the RD-861K still depended on the EP742 heat-resistant alloy that KB Yuzhnoe had procured from the TsNIIMV material science institute based in Korolev, Russia. Each turbine in the RD-861K engine is certified to operate in up to a dozen live firings before being replaced. Theoretically, a similar material for the turbine could be acquired elsewhere, but it would need to go through its own tests before being certified for use on the engine, an expert familiar with the matter said. The Ukrainian-built version of the RD-120 engine (on the left) will be a basis for the next generation RD-870 engine (right), planned for use in the Cyclone 4M. As outlined in the September 19th, 2017 RussianSpaceWeb post, "RD-870 could become Ukraine's first booster engine," the RD-870 engine is "intended to propel the first stage of the Tsyklon-4M (Cyclone-4M) rocket' and "will be based on a Soviet-era second-stage engine but redesigned to lift the rocket off the launch pad", instead of firing in the stratosphere." The RD-120 was developed at NPO Energomash in Moscow, but built in the Ukraine by KB Yuzhnoye (design) and Yuzhmash (manufacturing), except for its combustion chamber, which was "supplied by a manufacturer in Samara, Russia." The RD-870 is yet to be built. Graphic and photo c/o Anatoly Zak. The second stage of the Cyclone 4M rocket isn't the only stage with potential sourcing problems. There are also concerns over the Zenit rockets, which are intended to serve as the basis for the first stage of the Cyclone 4M. Sea Launch, a multinational launch provider which, until 2013 used a mobile maritime launch platform for equatorial launches of commercial payloads on specialized Zenit-3SL rockets, has plans to revive the mothballed service. But they'd prefer not to use the Zenit because those rockets are getting hard to come by. As outlined in the November 15th, 2017 Russian Space Web post, "Sea Launch seeks help from Roskosmos, proposes new applications," Sergei Sopov, the director general of the S7 Group which owns Sea Launch, has sent a draft of a potential cooperation agreement to Roskosmos head Igor Komarov. The latest plea for cooperation would open the Sea Launch platform to Russian satellite developers, who until now have relied almost exclusively on launch vehicles based in Kazakhstan or Russia. But it would also include, "the development of a new-generation cargo ship which could lift off from the Sea Launch to re-supply manned orbital stations." Cyclone 4M configuration, including the listing of the engines required for the program (four RD-870's and one RD-861K). The November 9th, 2017 SpaceQ post, "Maritime Launch Services Targets May 1 to Begin Construction at Nova Scotia Spaceport," quoted MLS CEO Steve Matier as saying that the work remaining on the rocket is more of a simple "integration of parts. Some of them are already done, but the work that Yuzhnoye is doing right now is essentially all the design work for integration of these known quantity and proven heritage components into the vehicle itself." Graphic c/o MLS. This new rocket would likely be a variation of the next generation Russian medium class launcher which, as outlined in the November 13th, 2017 Russian Space web post, "Preliminary design for Soyuz-5 races to completion," will be known as the Soyuz 5, and is expected to replace the Zenit rocket. The first prototype for the new rocket is expected to be tested in 2022. 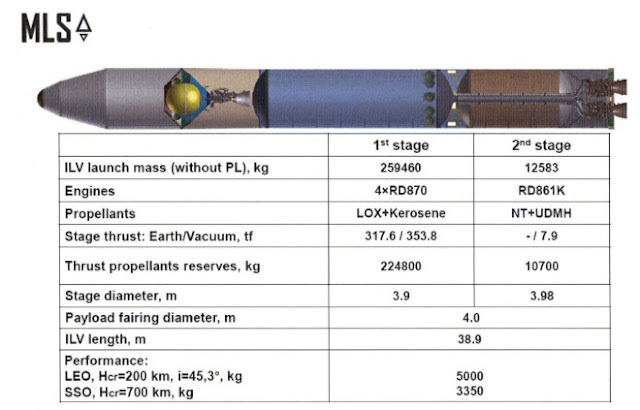 The five or more year development period is typical in programs of this type and would certainly have to be duplicated in the Ukraine, where the existing RD-120 engine used in the Zenit second stage, would need to be upgraded to the RD-870 engine which is supposed to comprise the first stage of the Cyclone 4M. If the Russians are taking five years or more to replace Zenit rockets and having trouble sourcing them now, what makes the Ukraine think that it will be able to source rockets for new Canadian customers? And how specifically would the Ukraine propose to take any less time to develop a new rocket engine? What's so special about their development process? As of now, no one knows. A Soyuz booster is assembled prior to a crewed flight to the International Space Station. As outlined in the August 20th, 2015 Spaceflight New post, "Russia to build new eco-friendly Soyuz-5 rocket by 2022," the proposed new rocket should be able to solve all the problems associated with the previous rocket model. This suggests a certain "fuzzyness" in the design parameters and indicates that there is much work still to be done before the design is finalized. Photo c/o Bill Ingalls / NASA. Speaking of Russia, it's worth noting that Roscosmos has a plan to compete with SpaceX, but that plan likely isn't going to work. As outlined in the November 13th, 2017 Ars Technica post, "Russia has a plan to compete with SpaceX—but it has a flaw," the Russian rocket corporation, NPO Energia, has fast-tracked development of a new medium-class launch Soyuz 5 vehicle in the hopes that it to be able to remain competitive with the existing SpaceX Falcon-9 rocket. But of course, five years from now, the Falcon-9 rockets are expected to be much more capable, reusable and able to launch nearly on demand for far less than the $60Mln US ($76Mln CDN) currently being charged. So the Soyuz 5 won't be able to compete when it rolls out in 2022, because SpaceX will have advanced with its capabilities. Is the Ukrainian Cyclone 4M able to compete with current SpaceX rockets? Nothing in the published specs indicate that it can. And when the actual Cyclone 4M rocket is finally rolled out, the indications are that it will be as far behind as the planned Russian Soyuz 5. Pavel Botsula, the head of design in Dnipro (oddly enough, the same city where both Ukrainian based KB Yuzhnoye and Yuzhmash have their HQ's), with Mikhail Andrievskiy, the head of propulsion system department at Dnipro and Daniel Smith, the business development manager at Edinburgh, UK based Skyrora. Photo c/o ROOM. But if all else fails, there are plans to relocate components of the Ukrainian space program to Scotland. As outlined in the October 25th, 2017 ROOM post, "Firm announces plan to launch rockets from Scotland," Edinburgh & London UK based Skyrora, a privately-funded launch vehicle developer with a research and development hub in Ukraine, has announced "plans for entering the small satellite launch market during the Reinventing Space conference taking place in Glasgow, Scotland, this week." 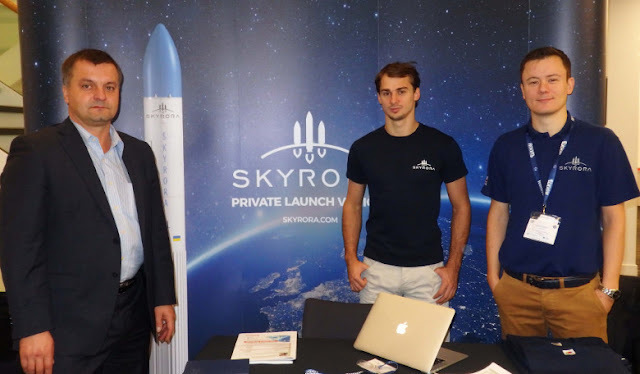 Over the summer, "Skyrora worked with a research and development hub in the Ukraine and with individuals that have experience on a number of major Ukrainian space projects," and visited the Shetland Islands off the north east coast of Scotland as part of their search for a launch site. The 15th Reinventing Space Conference was held in Glasgow, Scotland from October 24th - 26th, 2017. It focused on "novel applications that are becoming commercially viable as space technology improves. These include space tugs; space tourism; satellite refueling; debris removal; debris exploitation; manufacturing in orbit; real-time video from space; space mining; etc." Of course, as outlined in the September 11th, 2016 post, "Ukranian Based Yuzhnoye Design Office Eyeing a Canadian Spaceport for its Cyclone-4 Rocket," what the Ukrainians really need isn't a good location or strong manufacturing. What they really need is money (and lots of it) to help fund their ongoing development and build out the final product. Any suggestions that Ukrainian rockets are capable of flying now, with only a little bit of "integration" to fit together existing parts is obviously in error, given the facts of the situation. But the first country willing to provide money, lots and lots of money, will get a spaceport, eventually. It felt like the conference was spread over two days, as so much content was packed into the one day at the “Space Summit: A New Space Age,” event presented by The Economist Events, which came to The Museum of Flight in Seattle on November 9th, 2017. Waiting for A New Space Age at the Museum of Flight in Seattle on the morning of November 9th. Photo c/o Allison Rae Hannigan. A mix of inspirational, and entertaining, presentations with thoughtful discussions of pertinent issues to the current state of the space industry was offered for the well over 200 participants to enjoy. “Big Name” headliners included Lori Garver (the former deputy administrator to NASA), Steve Jurvetson (an American businessman, venture capitalist and former partner at venture capital firm Draper Fisher Jurvetson), planetary scientist Carolyn Porco and Russian entrepreneur, venture capitalist, physicist and DST Global founder Yuri Milner. A variety of formats was used to keep participants engaged, which was a refreshing change of pace from more typical conferences. Here are some highlights from the sessions, fireside chats, and “big bang disrupters” presentations and discussions. Famed planetary scientist, Carolyn Porco, who was imaging lead for the recently-completed Cassini Mission, gave a talk on that mission and some of its discoveries. She gifted the audience with beautiful pictures of Saturn and spoke about the moons Enceladus and Titan, and possible future missions there. She recalled her connection to Carl Sagan, and his “Pale Blue Dot” moment from the Voyager mission, when we could see Earth from space from the far reaches of the solar system for the first time. As outlined in the July 22nd, 2013 post, "NASA Releases Images of Earth Taken By Distant Spacecraft," the Cassini mission had a similar effect with its, “interplanetary salute” moment, when Earthlings were told to smile for the camera in July 2013. Earth as viewed through Saturn's rings. Photo c/o Graham Looney on Twitter. A ‘fireside chat” followed her talk, with one of the two moderators, Oliver Morton, the briefings editor at The Economist. Another “chat” was held later in the day between George Whitesides, the CEO of Virgin Galactic and Tom Standage, the deputy editor of The Economist. An inspirational talk and discussion was delivered by Susmita Mohanty, co-founder and chief executive of Earth2Orbit. She is a serial entrepreneur, who spoke of future space activities by private entrepreneurs. She shared her experiences to date, and also highlighted recent advancements in India’s space program. Challenging the audience to think of space activities in an inclusive way, she does not accept the commonly-used term "space colony" for historical reasons, and a new term needs to be imagined. Turning her vision to the future, Susmita said she will begin work on climate change research, and will eventually launch an earth observation constellation of satellites. Susmita Mohanty, co-founder and chief executive of Earth2Orbit in Seattle on November 9th, 2017. Photo c/o WaSpaceGrant. In a more familiar format, the morning started with a panel discussion about tools and vision for the next “great leap.” NASA’s Voyager mission was used as a benchmark for standards of technology over time, looking back at how it was so very “primitive” 40 years ago, and comparing it with today’s technology, as well as to what the future holds. Tom Bradicich, the head of IoT and intelligent edge systems at the event’s sponsor, HPE, made the case for using new technology in distant space to decrease latency in communications and control, for example on future Mars missions. “Project Extreme Edge is building technologies that are faster than fixed technologies, but they also are re-configurable on the fly,” he said, introducing the audience to his company’s newest space effort, putting a supercomputer, the HPE Apollo System (also known as the Spaceborne Computer) on the International Space Station (ISS). The concept is to use ordinary open standard technology, wrapped around with intellectual property and invention for added value. The innovation is with what he called the “software hardening.” Using predictive analysis and looking at problems such as memory leaks, resources being used in an exhaustive way, or even failing, the system is able to program around these issues and will have redundancy built into the software. Jim Bell, the president of the board of directors of the Planetary Society, and Robyn Gates, the deputy director of the ISS at NASA were also on the same panel, titled, “A Space Odyssey: The Tools and The Vision Powering Man’s[sic] Next Great Leap.” Tom Standage, the deputy editor of The Economist moderated. Another “space business” panel, “Down to Earth: The Global Economic Impact of Space,” featured Lori Garver, the former deputy administrator of NASA and current general manager of the Air Line Pilots Association (ALPA). In addition, Dirk Hoke, CEO of Airbus Defence and Space, as well as Brian Weeden of the Secure World Foundation and Dario Zamarian, the group president of Space Systems Loral (SSL) participated under the guidance of moderator Tom Standage. The purpose of this session was to examine the space economy and whether some of Earth’s greatest challenges can be solved by space-based technologies; while also looking at future business opportunities for entrepreneurs. Speaking of space, she said, “I just really think that fundamentally we need to shift how we invest our public dollars in these areas.” She basically advocated government spending less on big missions and more on enabling technologies so that the private sector can play a more commercial role. Dirk Hoke, Lori Garver and Brian Weeden. Photo c/o Allison Rae Hannigan. Carissa Bryce Christensen, the founder and CEO of Bryce Space and Technology, Peter Platzer the CEO of Spire Global, Chad Anderson, the CEO of the Space Angels Network and Pete Roney, the chief innovations officer at Thales USA were guided by Oliver Morton in a lively conversation during the business session about remote sensing called, “The Data Race.” The panel of experts and entrepreneurs all came to similar conclusions about the huge economic opportunities for extracting answers from all the imagery currently being collected. It’s big, getting bigger, and innovation is making the future come along faster than anyone can realize. The environmental benefits are also plain to see, as Earth’s resources are being monitored and managed more every day. Anderson cited the year 2009 as the “Dawn of the Entrepreneurial Space Age,” which is basically when SpaceX started operating commercially. His Space Angels fund has issued a new space investment report (the Space Angels Investment Quarterly Q3 2017) that makes this claim, and shows the rise of equity investment in the sector. With billionaires Elon Musk and Jeff Bezos putting their own funds into developing space transportation systems, the certainty in future markets gains legitimacy, and follow-on investment is happening in new systems, especially the Big Data remote sensing constellations. As outlined in the October 31st, 2017 Ars Technica post, "New report: Entrepreneurial space age began in 2009," SpaceX launched its first commercial payload in July 2009, a date which marked the "a key inflection point between the "governmental" space age and the "entrepreneurial" space age." Graphic c/o Space Angels Investment Quarterly Q3 2017. Barret Schlegelmilch and Steven Link, co-presidents of the MIT Astropreneurship and Space Industry Club and Ariel Ekblaw, Founder and lead, MIT Media Lab’s Space Exploration Initiative, each presented about their initiatives for self-assembling in-orbit architecture, bioengineering genomes for space and blockchain-mediated satellite telecommunications as they look to democratize access to space exploration technology with the help of source materials from the MIT Media Labs. Scaring the (Expletive) Out of Us! “Space junk: clean-up time” painted a grim picture not only of human impact on the orbital environment, but also the geo-political risks we face here on Earth as potentially threatening space assets. The United States’ Air Force Space Command is tracking around 22,000 pieces of man-made space debris, mostly bigger than 10 cm across, and there are estimated to be hundreds of thousands more smaller fragments. Twitter was also active in Seattle on November 9th. Image c/o @TheAerospaceCorp. Nobu Okada, Founder and chief executive, Astroscale, Jamie Morin, Executive director, Center for Space Policy and Strategy, and vice president, The Aerospace Corporation, and Saadia Pekkanen, Associate director, Jackson School of International Studies, University of Washington each gave their perspective on the situation. Although the final session, a “spotlight interview,” with Yuri Milner, the founder of DST Global, finished the day, the lasting impression will be the quite lively and downright funny “Three Way Debate” between Naveen Jain, the founder and chairman of Moon Express, Chris Lewicki, the president and CEO of Planetary Resources, and John Logsdon, the founder of George Washington University’s Space Policy Institute. Elon Musk has joked that he wants to die on Mars, “Just not on impact,” and the debate premise asks what will he see from his deathbed 100 years from now? Habitation on the Moon, Mars/Asteroids, or neither? Lewicki presented his case with the calm, cool and snark precision of a planetary scientist and engineer, arguing that we will find many more riches in asteroids than those spread very thinly on the Moon. As for Logsdon, well, despite his personal desire to see all of these scenarios succeed, he is convinced that humanity will not succeed at any of them. He argued that we’ve had since Apollo to make the case to the public to fund future space exploration, and have failed to secure the support needed. Fortunately, most of the rest of the people attending the conference were much more enthusiastic. Perhaps we were simply more focused around the entrepreneurs and private sector rather than concerned over public funding for government programs, while Logston's focus was on the governments and the public policy decisions which define their role. But as outlined in the November 9th, 2017 Geekwire post, "‘New Space Age’ gathering sets the stage for commercial spaceflight’s big year," this year is supposed to be a big one for the private sector. That's where the energy and the ambition is currently concentrated.